Several years ago, I did a painting called “Saturday Morning.” It basically depicted men working together on, yes, Saturday morning. This is what people do here in the country. You cannot do everything yourself so you pitch in and help the neighbor, or he you when you need it. This morning we had to say goodbye to an old friend. We have a giant elm which was here since we bought the place over 25 years ago. Everyone marveled at its beautiful shape and how it had magically escaped elm disease. Unfortunately, it began dying last year and we had to take our old friend down today. It was very close to the house and would have been a real danger during the next big storm. Taking down the elm which was leaning one way while we wanted to fell it in another was challenging and not without risk. Fortunately, these two guys have felled many trees but anything can happen. I documented this not only for my old tree friend but to let you know of some of the dangers. 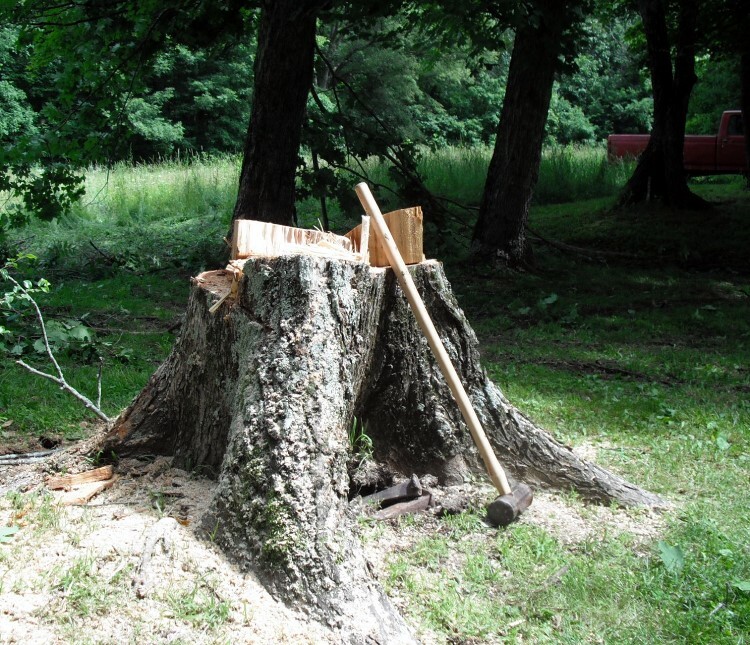 If you don’t know anything about taking down a tree, hire an expert. Elm is very hard. It already wore out one chain on the saw. The tree has been notched in the direction it “should” fall. Now making cuts on the other side which will release it. Driving the wedges. This takes some real muscle. The elm starts to go but gets hung up in the surrounding trees. This is really dangerous and is called a “widow-maker” for a reason. Next step is even more dangerous. That is pushing the tree over with some heavy equipment. The tree is off the stump but still not down. The danger here is it could kick back, knock other branches down, etc. Finally, the tree crashes to the ground with much cracking and popping. Sawing it into manageable lengths in order to drag it out where it can be worked on. Dragging out a log. This, too, is dangerous. If the log gets hung up, it can cause the tractor to tilt back over the driver. Or the chain can snap, injuring or killing the driver. Always need a spotter for this step. A well-deserved break. Unfortunately, now the rest of the work begins with the clean-up, log splitting, stacking, etc. Nothing will go to waste for this old friend. This entry was posted in country living, old house, Uncategorized and tagged country living, danger, elm, felling a tree, old house. Bookmark the permalink.